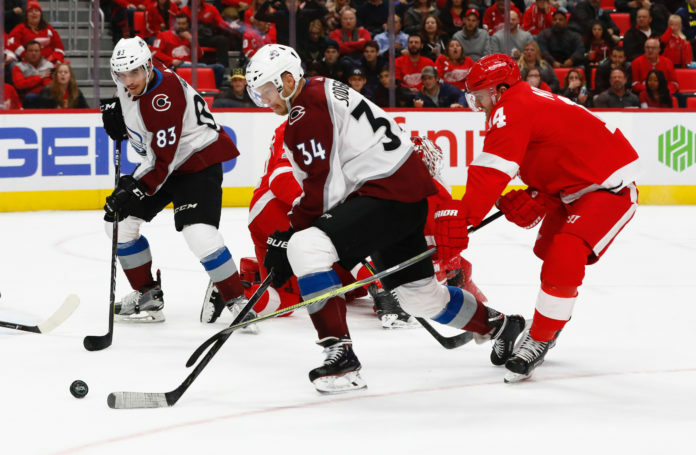 The Colorado Avalanche went into Detroit and shut out the Red Wings 2-0, in what turned out to be a chippy game that gave you some very small flashbacks to the 90’s, when these two teams would battle several times a year. The win now means the Avs have collected points in 11 straight games, winning nine of them. 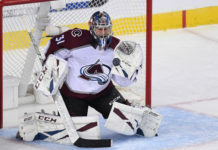 After the game against the Blues, when St. Louis physically took it to the Avs, the Avs showed some pushback on Sunday. Zadorov started it early with his usual physical play, but he was joined by Cole, Nemeth, and Calvert, among others. The Avs are very clearly a skill-first team, but showing some backbone when you need to isn’t a bad thing. Both Cole and Nemeth jumped for some clean hits, while the Red Wings didn’t want anything to do with Zadorov. Semyon Varlamov didn’t have to be spectacular by any means, but he picked up his first shutout of the year, and 24th of his career with steady play. He made a big mistake behind his own net with the puck in the second period, but ended up bailing himself out. That was about as close as the Red Wings got to scoring all night. Nathan MacKinnon was named the NHL’s 2nd star for November, and he started his December off right with the game-winning goal and an assist on an empty-netter. MacKinnon is on pace for over 50 goals, which would be something the Avalanche organization hasn’t seen in well over a decade. The Avs “shutdown” line of Matt Nieto/Carl Soderberg/Matt Calvert had arguably their best defensive effort of the season. 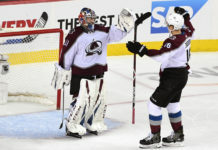 Typically, they get out-possessed by the opposing team on a regular basis, but on Sunday, the trio was the Avs’ best possession line, with all three of them finishing above 60%. J.T. 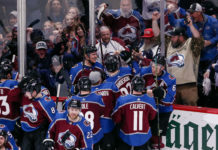 Compher was elevated to the second line, with Alex Kerfoot moved to the fourth line after a subpar effort against the Blues. The second line performed well, but were unable to finish any of their opportunities, including a breakaway chance for Tyson Jost in the third period. This will be something to watch on the road trip, as Compher has earned some more ice time. The Avs road trip continues on Tuesday night, when they head to Pittsburgh to take on the Penguins. The game starts at 5 PM MST.